In the wake of continuing search for reliable, lighter and cost-effective components by industries, markets and users, engineers apply compression moulding of composites to substitute metal components. 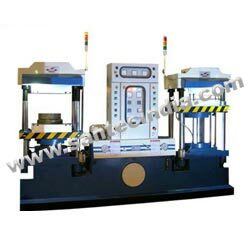 Compression moulding presses are capable of producing voluminous amount of fiber-reinforced plastic parts in significant volumes, with speed and accuracy. Moreover, composites produce components with thinner walls than their metal counterparts. This weight and cost reductions has promoted the development of long-fiber-reinforced thermoplastics (LFRT) and sheet molding compounds (SMC) as well as bulk molding compounds (BMC). When composites began to replace automotive metals, the new materials were typically adopted into a part design previously optimized for steel. The resulting parts were over-built in terms of performance properties, but reaped immediate benefits in weight reductions. As development programs progressed, however, parts were optimized for the new materials. Engineers redesigned them to minimize weight within the scope of the part's specified performance requirements. With the advent of LFRT and more reinforcement-intensive thermoset compounds, industries see opportunity to further adjust wall thickness and other part dimensions, not only in composites-for-metal changeovers but in existing composite designs as well. The longer fibers as much as double the impact strength and flexural modulus of comparable short-fiber compounds. In thermoset applications, similar results are being achieved with greater percentages of fiber loading and the use of high-performance fibers. High-performance fibers and high loading add strength and rigidity to composite components.